The Cartier Ballon Bleu watch is a modern icon, beloved by Cartier fans and celebrities like Kate Middelton and Johnny Depp. We explore the brief history of this instant fan-favorite watch and share five pointers on how to spot a fake Ballon Bleu de Cartier. The elegant aesthetic of the Cartier Ballon Bleu watch belies how new the model is for the 170-year-old Cartier brand. The Ballon Bleu de Cartier was just introduced in 2007 and, with is polished sensibility and widespread popularity, is poised to be a classic on par with the Cartier Tank Watch. 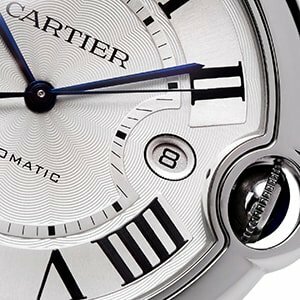 The Ballon Bleu de Cartier watch has a distinctive and distinguishing rounded shape. The bold Roman numerals and mother-of-pearl dial build upon the watch’s sophisticated appeal. And the Ballon Bleu de Cartier’s signature feature is the sapphire cabochon crown which is housed by the integrated crown. 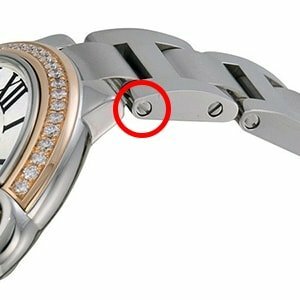 The metal links of the Ballon Bleu de Cartier watch bracelet will always be held together by screws—never pins. Forged watches use cheap pins and tubes to secure the bracelet. You should be able to see the screw’s slot drive, the straight groove on the screw’s flat head used to tighten the screw. 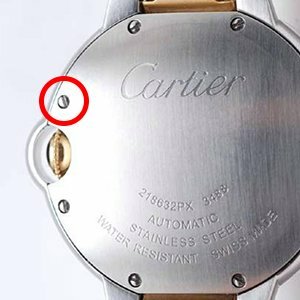 If the bracelet screw does not have a drive, the Cartier Ballon Bleu watch in question is a fake. Like the bracelet, the Cartier Ballon Bleu case back is held in place with small screws. However, forgers use inexpensive snap case backs that can be pressed closed without screws. 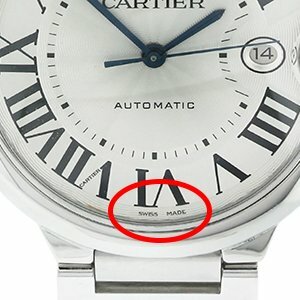 The watch case back should also be engraved with Cartier’s name, the serial number, case material and number. The engraving should be clean and crisp. One of the most notable design features of the Ballon Bleu de Cartier watch is its beautifully detailed dial. Cartier artisans painstakingly engrave every non-mother-of-pearl Ballon Bleu dial with an elaborate and ornamental circular pattern known as guilloche. Cartier Ballon Bleu forgers may try to replicate this intricate guilloche motif, but, because it requires an expert hand to perfectly execute the design, the lines will not be clean, parallel or exact. More often than not, faux Ballon Bleu de Cartier watches won’t even include the guilloche print and the dial will be left blank. Just below the 6 o’clock marker, the Cartier Ballon Bleu watch is stamped with a minuscule “Swiss Made.” This incredibly small detail is frequently overlooked by counterfeiters and omitted from imposter Ballon Bleu de Cartier watches.